Borzi, A, & Oosterlee, C.W (Eds.). (2013). 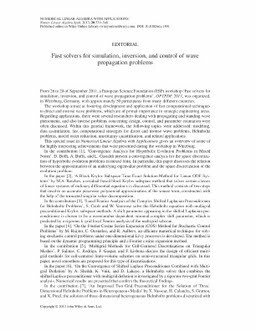 Special issue dedicated to OPTPDE2011: Fast solvers for simulation, inversion and control of wave propagation problems. (A Borzi & C.W Oosterlee, Eds. )Numerical Linear Algebra with Applications (Vol. 20, pp. 539–540). Wiley.